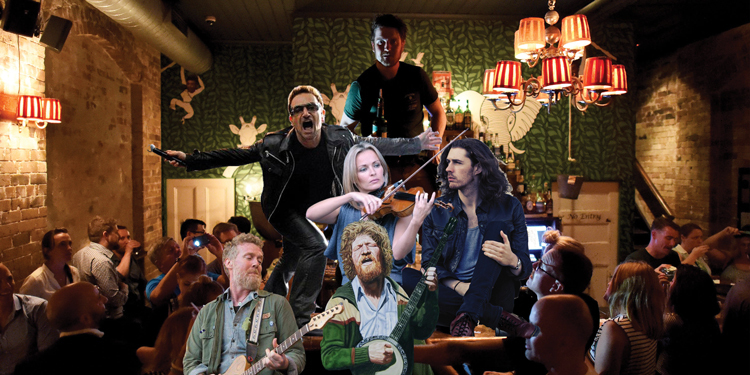 Ireland’s thriving music culture will be celebrated at the Wild Rover’s weekly trivia night on Tuesday 12 March, the week leading up to Paddy’s Day Weekend at The Wild Rover. Trivia Tuesdays at the Rover sees up to 50 people in teams of 2-6 to battle it out for a $100 bar tab and a bunch of goods from our friends at Jameson. On the Tuesday leading up to Paddy’s Day Weekend, the theme for the night’s trivia will be Music from Ireland – a theme spanning from the emergence on the international stage of The Dubliners in the 60’s to U2, The Cranberries and modern era artists such as Hozier and James Vincent McMorrow. 50% of the questions will have Irish flavour and for those who have been to our trivia night before know, even if you’re on top of the leaderboard at the final questions – anyone can win with the final point gamble on the last question! Your dinner menu on the night will consist of Spuds with Guinness Gravy, Spiced Lamb Sausage Rolls, Oysters and our house Ploughman’s Boards.